It’s that time of year again … zucchini season! This flavorful bread is a great way to use up oversized (and overly plentiful) squash hiding in your garden. Enjoy! Busy, busy weekend. Blueberries picked. Check. Zucchini shredded. Check. 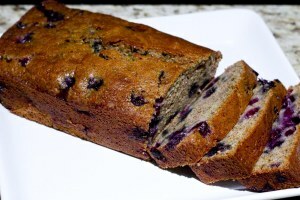 Now it’s time to get down to business … Zucchini Bread and Blueberry Butter! Mix these together in a bowl. Then add . . . 2 cups grated zucchini. In separate bowl combine, then stir in gradually . . . This entry was posted in Uncategorized by heidihesssaxton. Bookmark the permalink.